A new crime-fighting force is coming to the streets of Wales - the Mini Police. 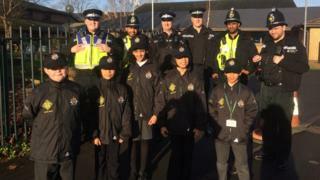 Nine to 11-year-olds from three Newport primary schools are the first to take on the role, patrolling the city's streets with their adult colleagues at Gwent Police. So far, 58 youngsters from Millbrook, Ringland and Pillgwenlly schools have enrolled. There are plans to roll the scheme out to another 20 schools in the Gwent force area. Ten-year-olds Joseph, Zeena, Aliyah, Alexis and Ahmed are just five of the children at Pillgwenlly Primary School who were chosen for the Mini Police force after a tough selection process. A total of 87 children applied and their parents had to give consent. Aliyah said: "I wanted to help the community, help the police and help everybody else that needed the help from us. "I was excited when I was chosen and I didn't know what to say, my mum was very excited too and I didn't know what to think." Her mother, Ayesha said she was "110% proud" of her daughter. "She's been talking about being a mini police officer for such a long time, she described to me exactly what she wants to do for the community and what she wants to become when she is older and I cannot be more happy for her." Joseph said he wanted to join because it sounded "cool". He said everyone at home was very proud. The young officers will be taking part in a Newport-wide action day on Wednesday. They will be patrolling the streets, meeting local people in Pill and talking to them about their concerns around crime and anti social behaviour - and they will be reporting back to the inspector for Newport West, Paul Davies. He said: "We're really hoping this is going to have a massive impact on their confidence, on the positivity within the school and the community. "You can see with the smiles on their faces, it's going to be great for them." Last year, the Pill area of Newport found itself in the spotlight for all the wrong reasons. In October 2016, there were riots. Emergency vehicles were pelted with fireworks and rocks, bins were set on fire and many local people were afraid to leave their homes. Three men were later jailed for violent disorder. The community is one of the most deprived in the country. Since the riots Gwent Police has been working hard to build links. Engaging with the next generation is a crucial part of the plan to change life in Pill for the better - for everyone. Alexis said she enjoys wearing her uniform, which includes a specially designed cap, T-shirt and a jacket emblazoned with the words Heddlu Bach. Ahmed said he would like to work with the police when he is older. Pillgwenlly Primary School headteacher Kath Bevan said she has seen big changes in the children. "We've seen an increase in their self-esteem, their importance, their stepping up to take responsibility within the school and the wider community," she said. The Mini Police was set up five years ago by PC Craig Johnson, from Durham Constabulary. As a neighbourhood police officer he wanted to change the relationship between the police and the community in the former mining village of Catchgate in County Durham. Five years on, more than 100 schools across the UK are involved. Police in Durham, Merseyside, Lincolnshire, Northumberland, Avon and Somerset, Thames Valley and Gwent force areas all now have Mini Police officers. Next year, Dyfed-Powys, Nottinghamshire, West Yorkshire, South Yorkshire, Cumbria and the City of London Police forces will also join in.